We’ve been moving non-stop since we’ve been here. Tuesday morning we slept in and decided to have a more relaxing day, but in the same areas as the day before). 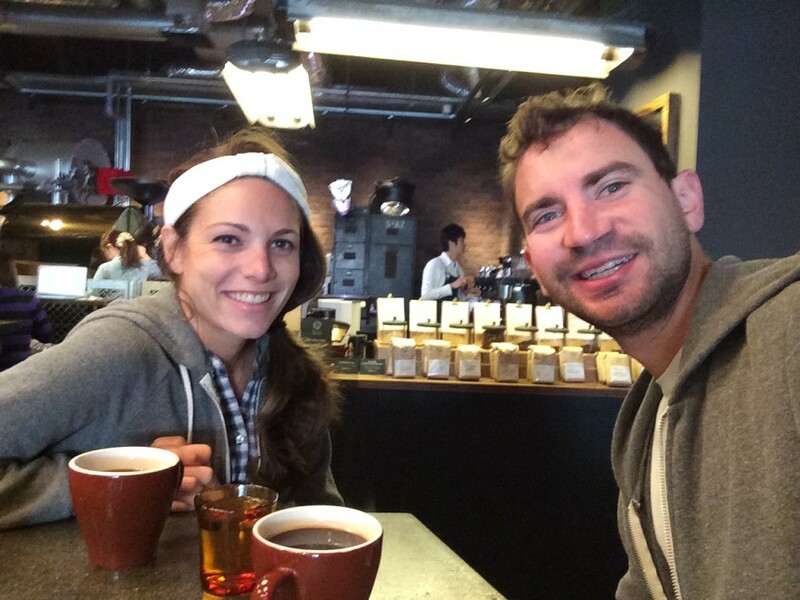 We started off the day going back to Bagel Bagel for breakfast, and to The Roastery for coffee. Then we wandered into a few of Tokyo’s many sock shops (these shops, dedicated to the sale of socks and socks only, exist on every corner in this city—who knew how popular socks were here?). 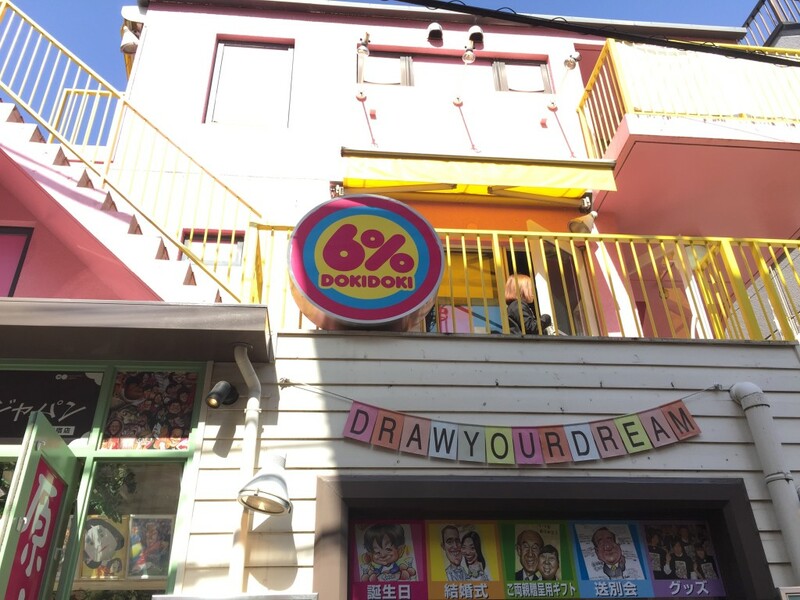 When we were near Harajuku we went to a store called 6% Doki Doki and I bought a cartoon tooth ring (so appropriate for my family). Such a cool store! One of Tokyo’s many sock shops (these shops, dedicated to the sale of socks and socks only, exist on every corner in this city—who knew how popular socks were here?). 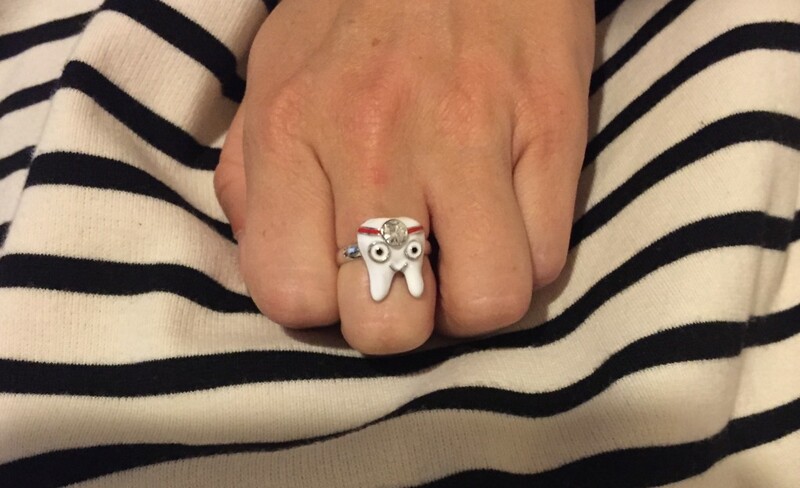 When we were near Harajuku we went to a store called 6% Doki Doki and I bought a cartoon tooth ring (so appropriate for my family). Such a cool store! Welcome to 6% Dokidoki! 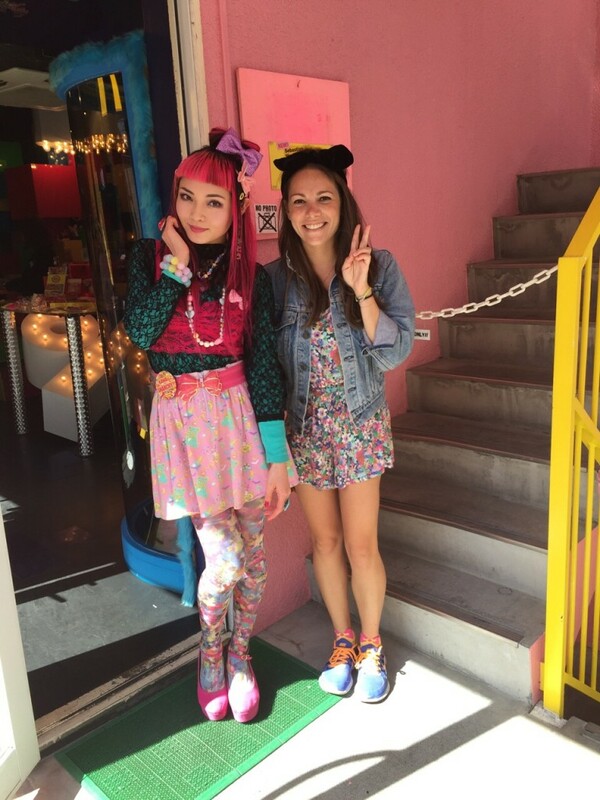 A sensational “Kawaii” shop in HARAJUKU which is recognized as the most avant guard representation of Japanese pop-culture. 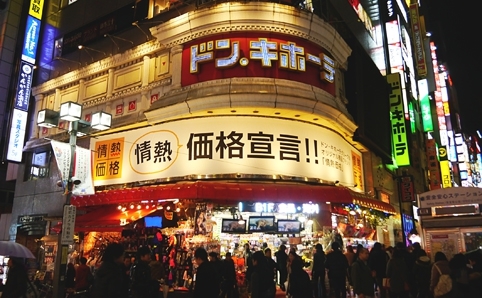 According to the store their concept is “sensational-cute”, “shocking cute”, “cute beyond the time”, “cute too mono-things”. 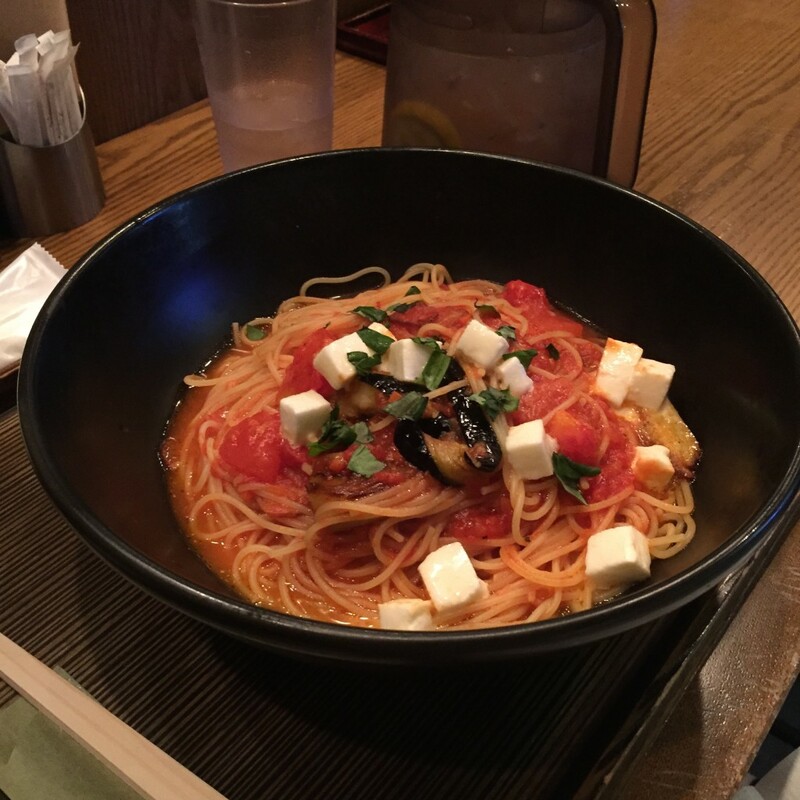 For lunch we went to Bill’s Omotesando a new restaurant by Bill Granger (Anthony Bourdain’s friend). 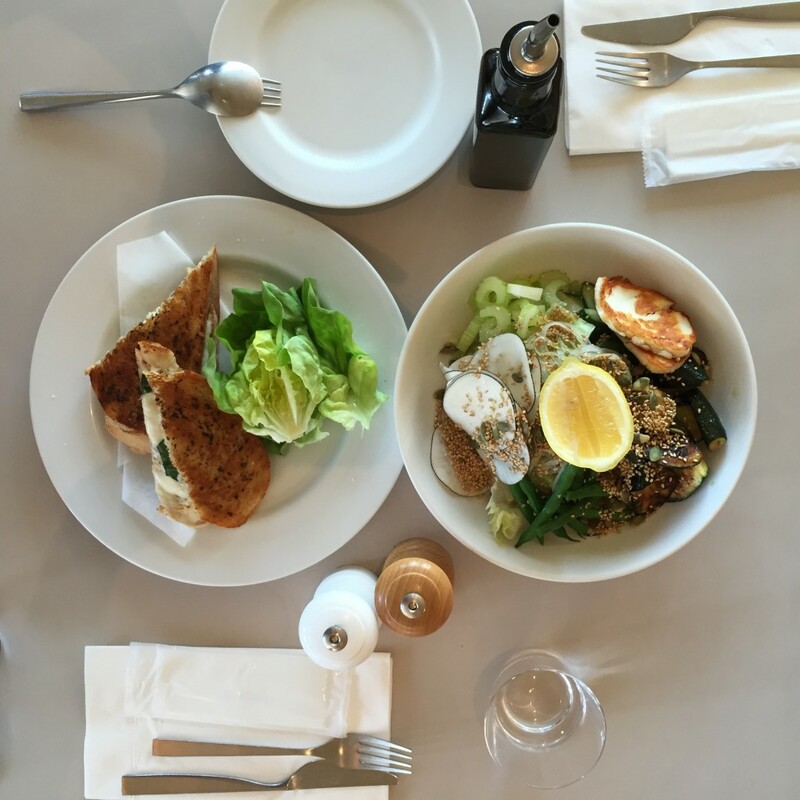 The food was ridiculously good! I think I had one of the most delicious salads of my life with grilled halloumi cheese and vegetables. Daniel got an amazing sandwich with sage and mozzarella cheese as well as ricotta filled pancakes with banana. 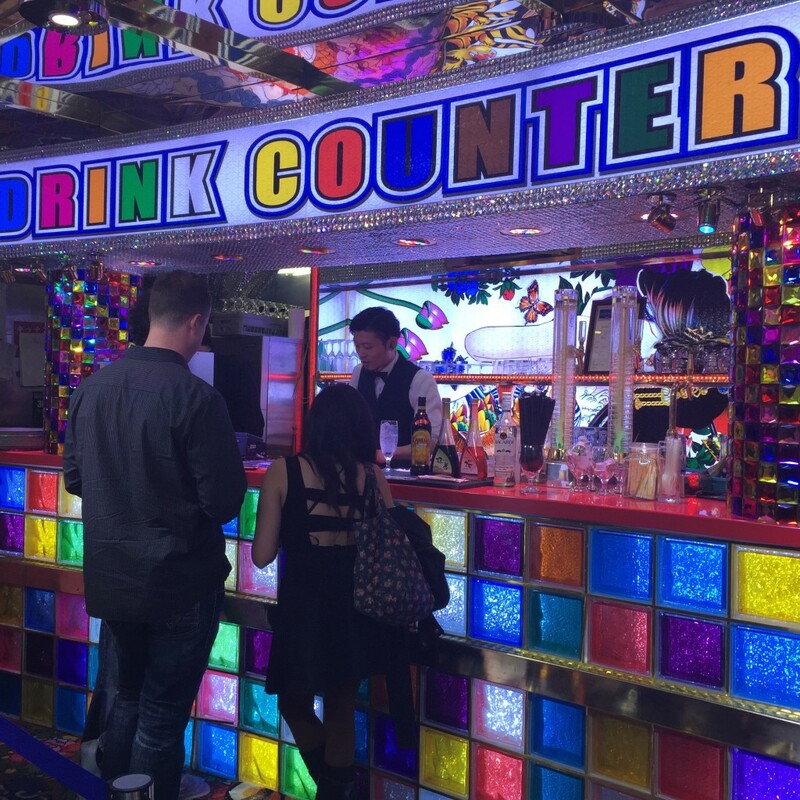 We would both highly recommend this restaurant to anyone visiting Tokyo so long as you’re up for an hour wait—but we promise the food is really that good! Lunch at Bill’s Omotesando I think I had one of the most delicious salads of my life with grilled halloumi cheese and vegetables. Daniel got an amazing sandwich with sage and mozzarella cheese. 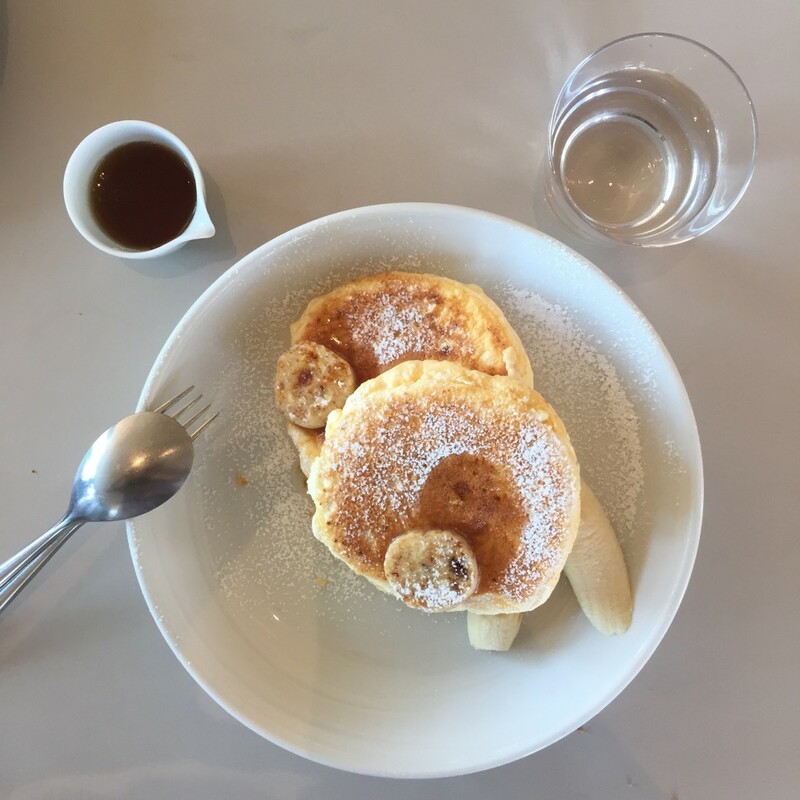 The most amazing ricotta filled pancakes with banana. In the afternoon Daniel and I split up, he wanted to do some work and I wanted to explore more of Shibuya. So I had a good few hours of getting lost in the shopping streets and malls of the area (but was too overwhelmed to buy anything) before reconvening back in Ebisu. 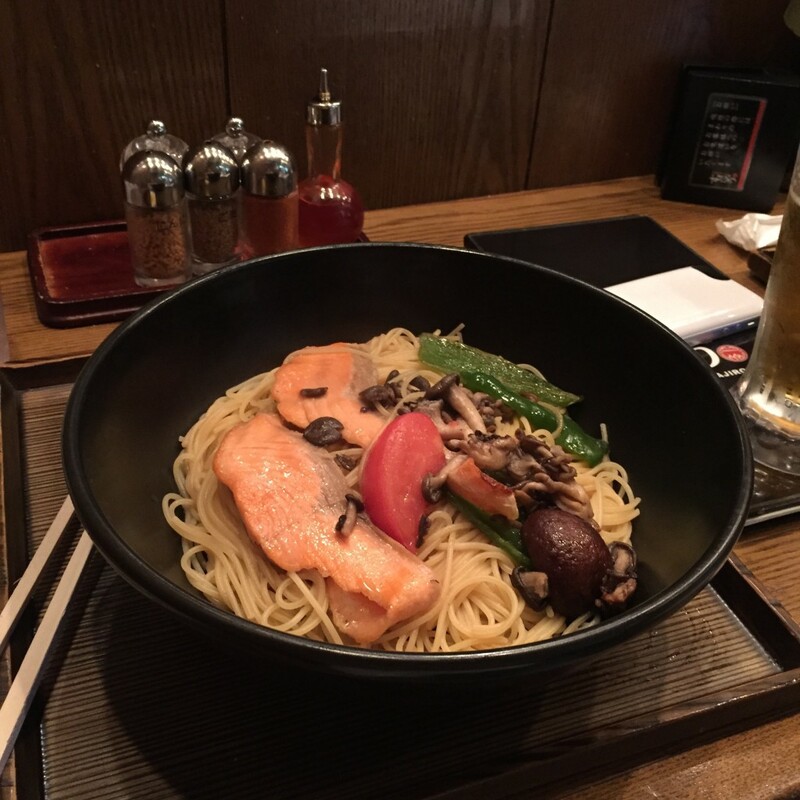 We had a few drinks in the room (beer and sake) and then returned to SpaJiro for dinner at 11:00 PM (we had to convince them to let us in as they said the had already closed the kitchen—but when we told them we had came back a second night in a row, they miraculously let us in). Once again the food was delicious! 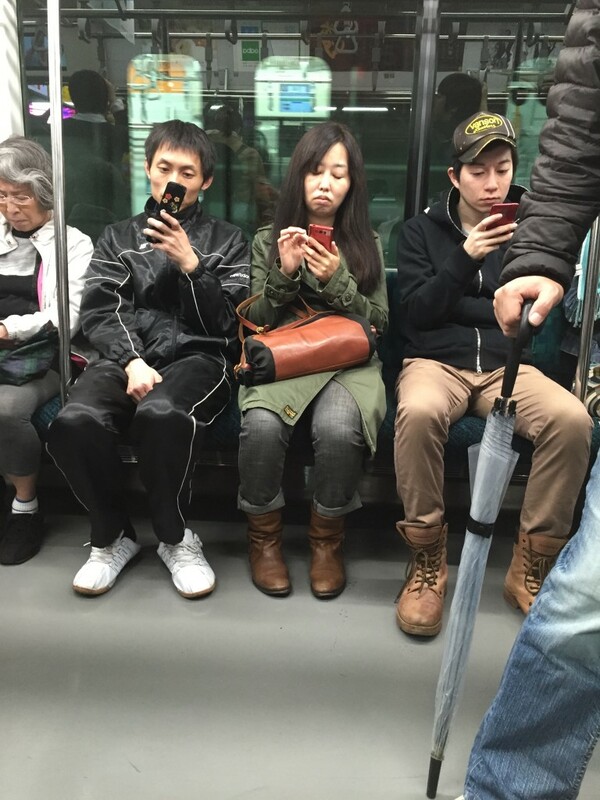 This is what everyone looks like on the JR—even thought they are the only public transit system I have ever been on that explicitly states no cell phone usage. Creatures of habit—got the same thing. 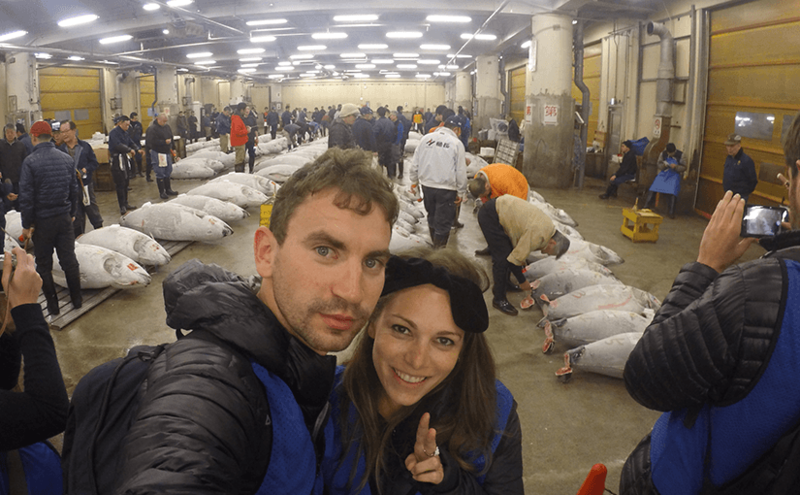 From 12:00 PM to 3:00 PM we bar-hopped and walked the streets to keep ourselves awake as we decided to go to the Tsukiji Fish Market with hopes of making it to the famous tuna auction. We took a cab at 3:15 in the morning and were the 64th and 65th people (we made the second group) to arrive out of a maximum of 120 people. 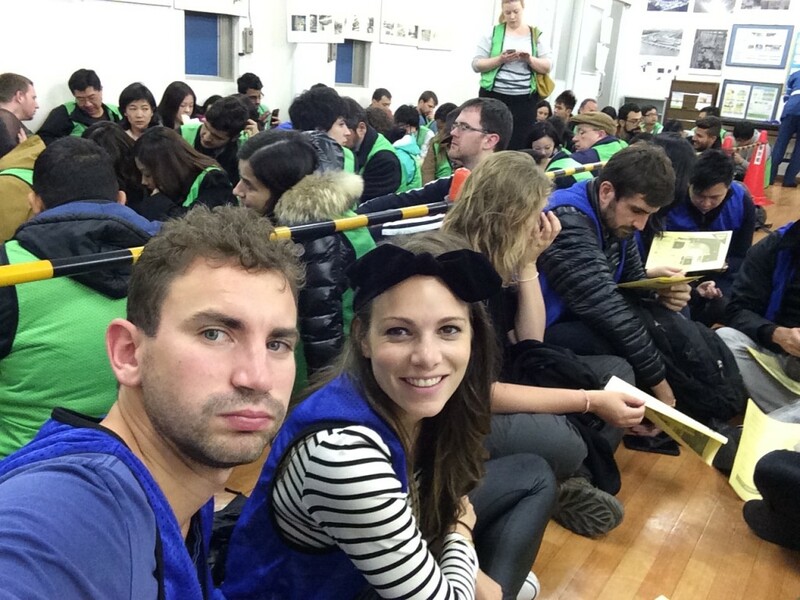 We were given blue jerseys to put on over our clothes to identify us and sat in a “waiting room” until 5:50 AM when we were finally called into the auction.—If you want to see the Tsukiji tuna auction, here’s how it works. 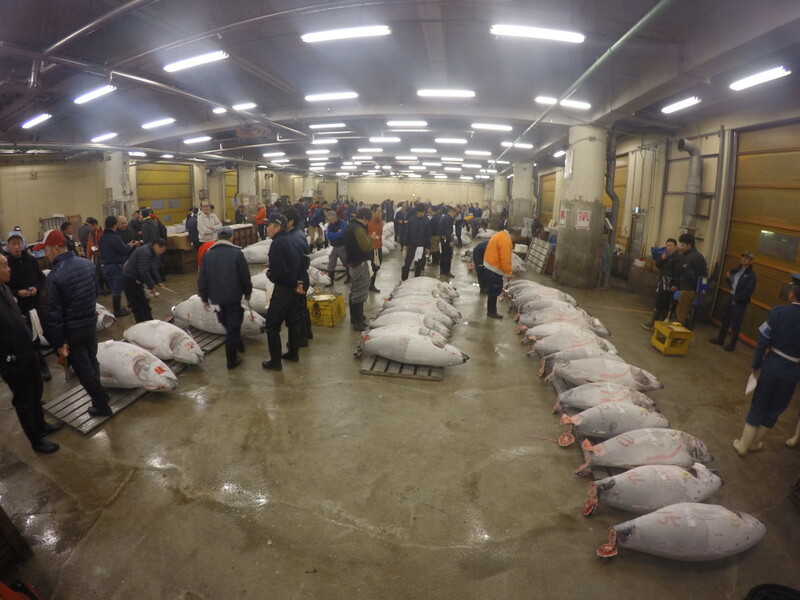 When you arrive at the fish market you must “apply” at the Osakana Fukyu Center (Fish Information Center) at the Kachidoki Gate, starting from 3:00AM on a first-come, first-serve basis. A first group of 60 visitors will be admitted to the auction between 5:25 and 5:50, while a second group of 60 visitors will be admitted between 5:50 and 6:15. 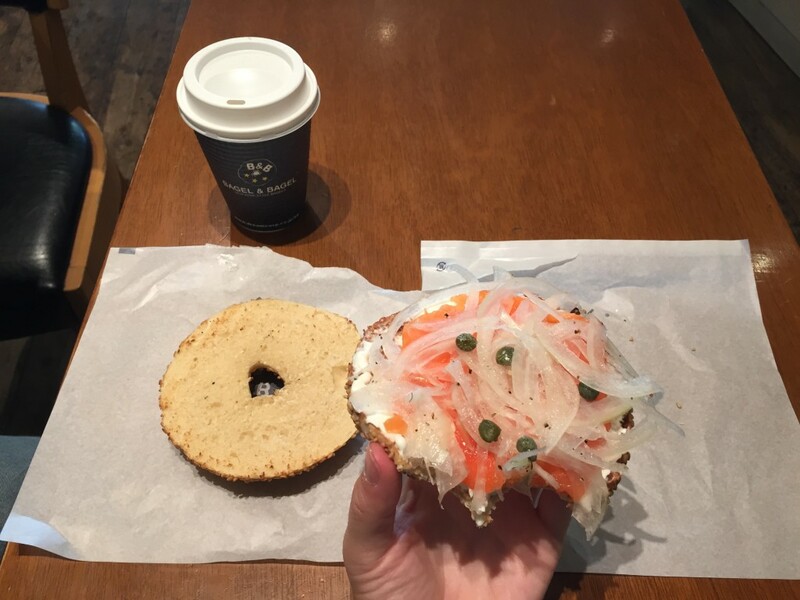 If you don’t make it early enough, they will turn you away. 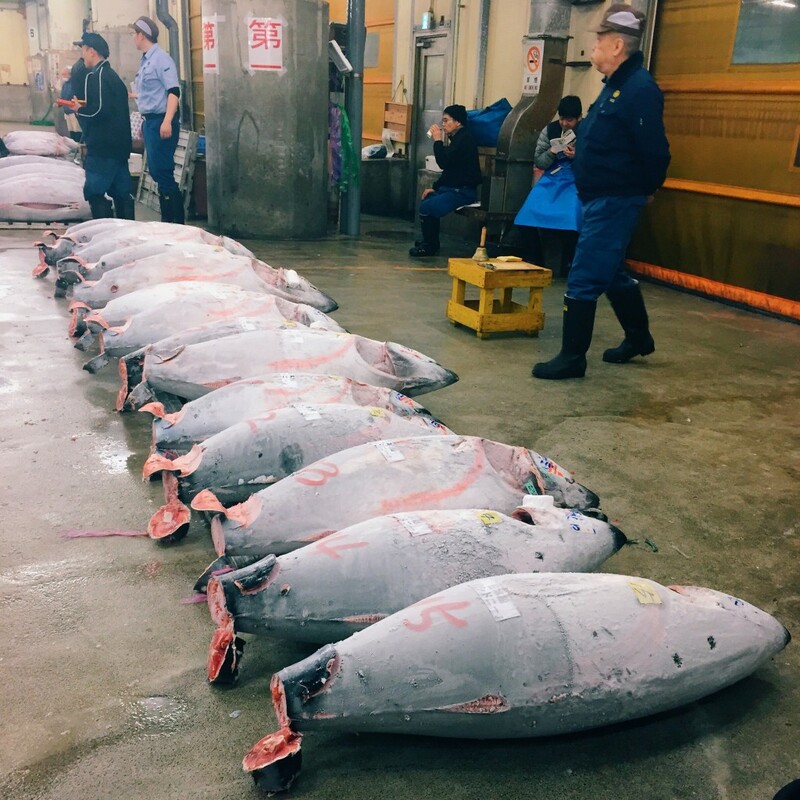 A basic map of the Tsukiji Fish Market. 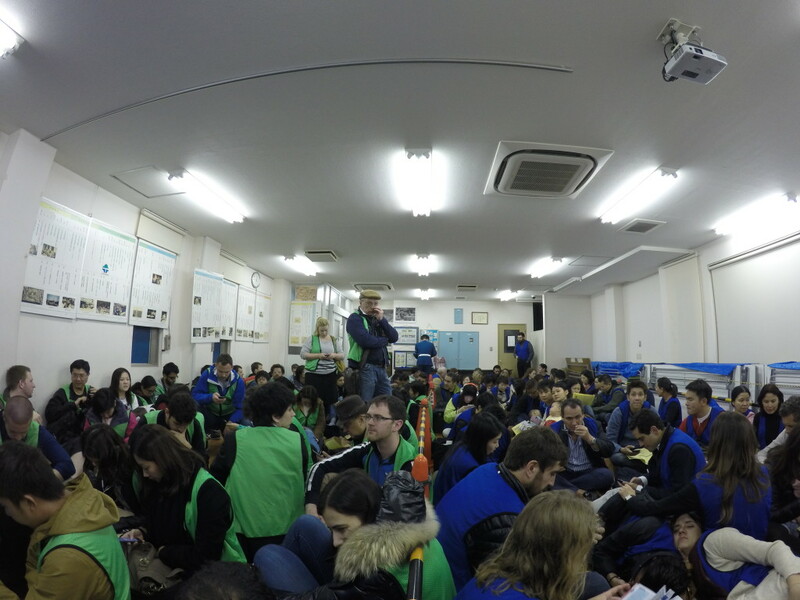 The “waiting room” at the Tsukiji Fish Market looks like two teams waiting to play each other in something —even though most people are sleeping. 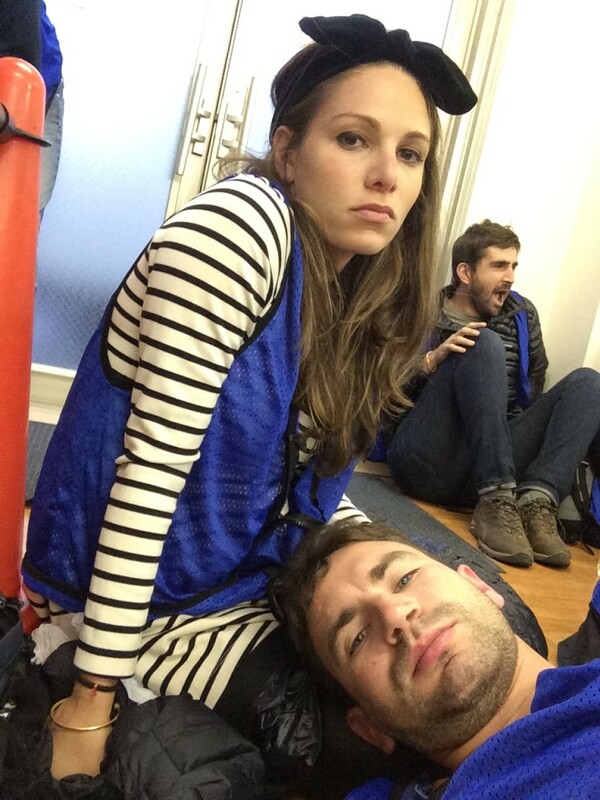 And now it’s 5 AM and we still have to wait another 50 minutes. 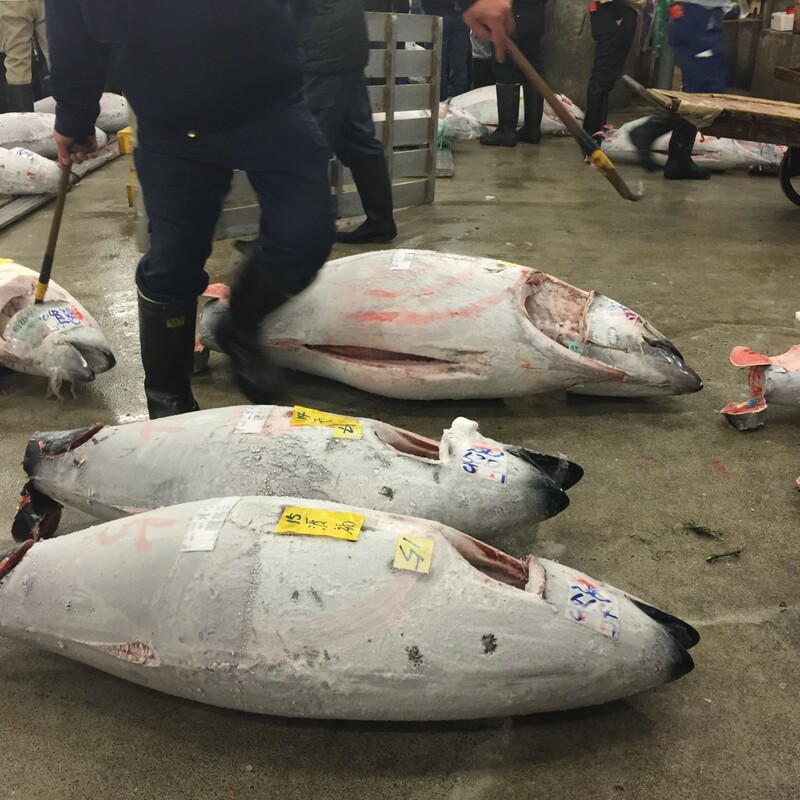 When we walked into the auction room we a bunch of sushi chefs standing over a couple hundred massive flash frozen tunas rubbing, poking and prodding them with some type of a hook on a stick . Moments later a man jumped on a box crate and started the auction; he was shouting so passionately he was basically singing. 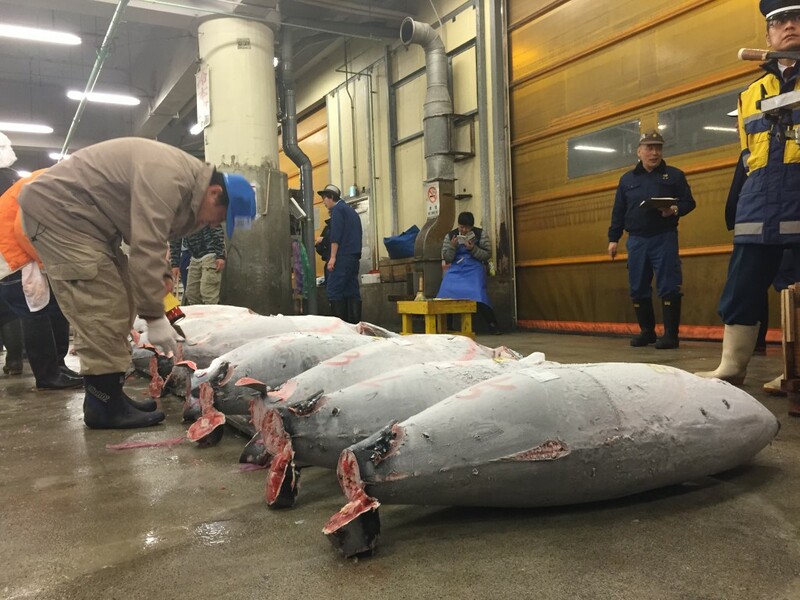 The auction was super quick and within a matter of minutes some of these men had spent the equivalent of a couple thousand dollars up to ten thousand dollars per tuna. Crazy! One of the many auction area’s in this massive building where tuna auctions take place. Dragging out the tuna he just paid for. 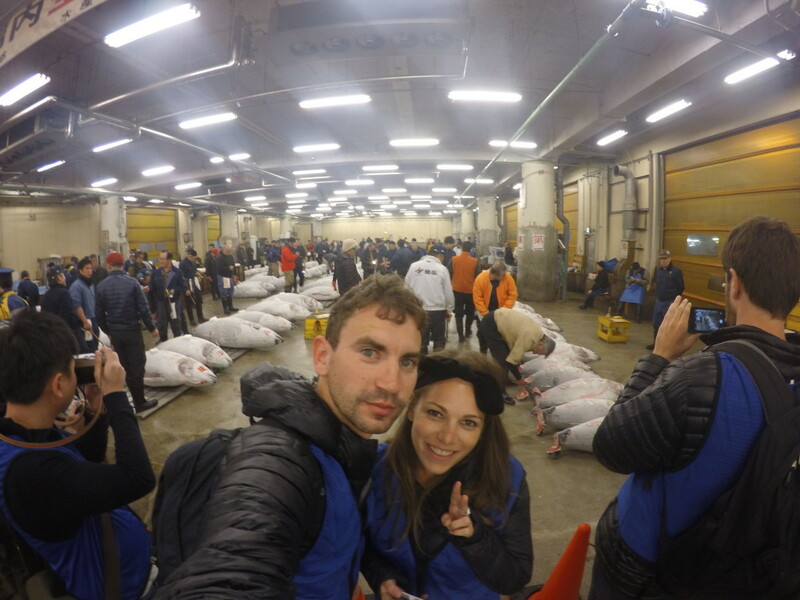 At 6:30 AM we walked out of the tuna auction and into the outdoor fish market where we immediately got into another line to wait for fresh sushi for breakfast. 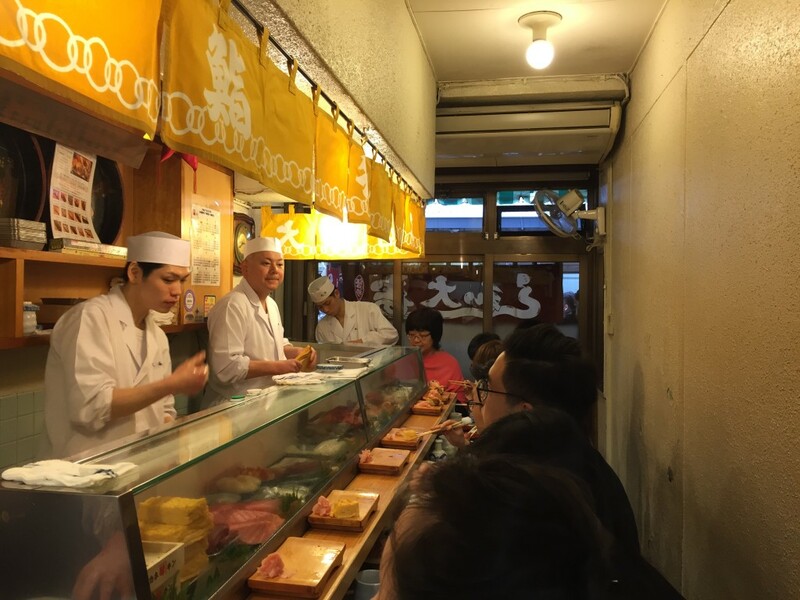 After an hour and a half later we finally made it to the front of the line for Daiwa Sushi, Tsukiji’s most famous sushi bar, after which you’ll be expected to eat and run, restaurant with 11 seats at the bar. The chef made us the most delicious sushi of all time (I know I’ve said that before, but this was really the winning meal of the trip) and when we left we were absolutely exhausted. We somehow managed to make it back to our hotel without falling asleep on public transit and spent the most of the day sleeping. 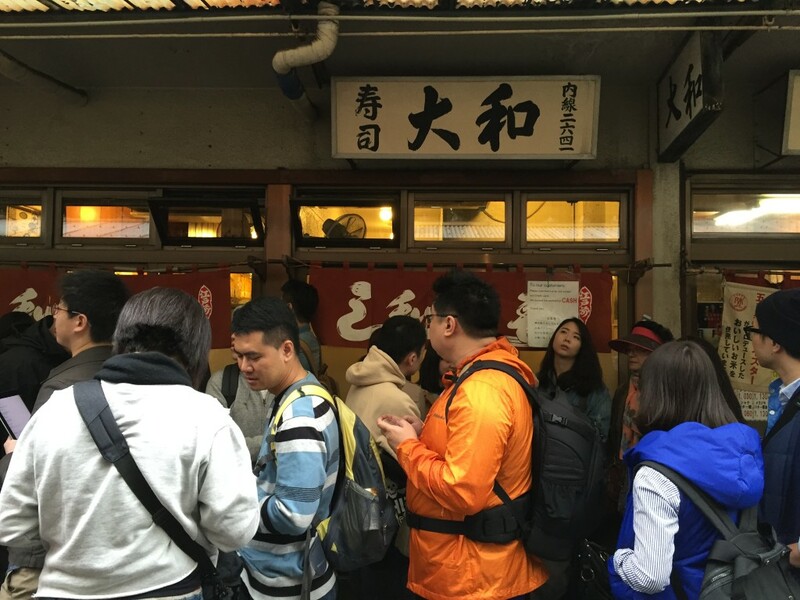 Waiting in line for Daiwa Sushi at the Tsukiji Fish Market at 7 AM. 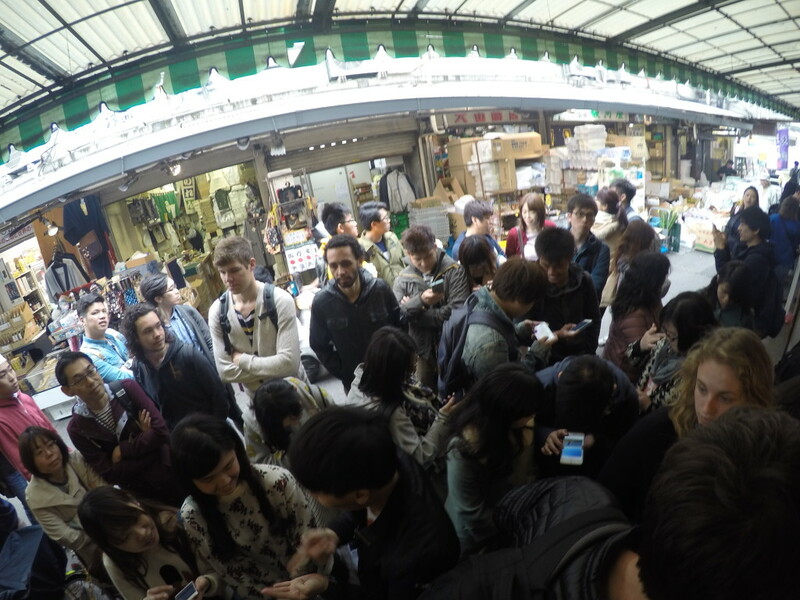 The line for Daiwa Sushi Tsukiji Fish Market. Inside of the amazing Daiwa Sushi where you’re expected to eat and run. Us post eating the best sushi meal of all time! 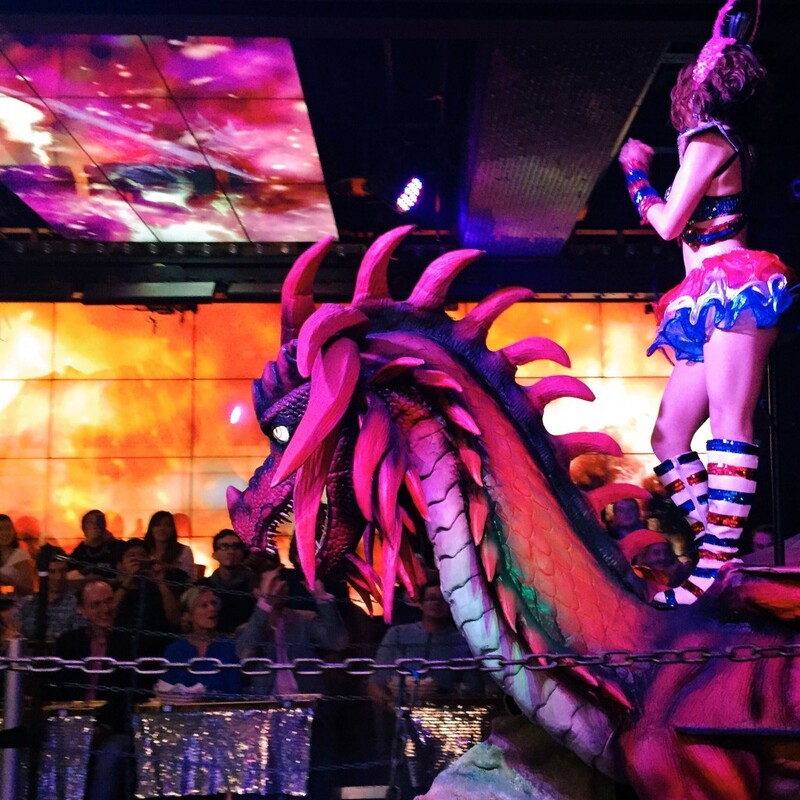 During the show the forrest people fought against the real robots using robotic animals and mystical creatures. So Cool! 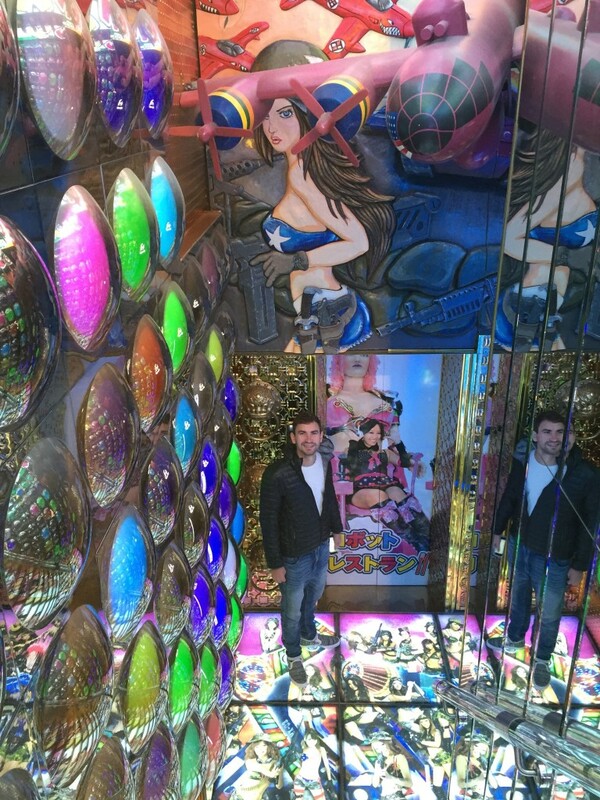 Daniel entering the Robot Restaurant down 3 flights of psychedelic stairs. 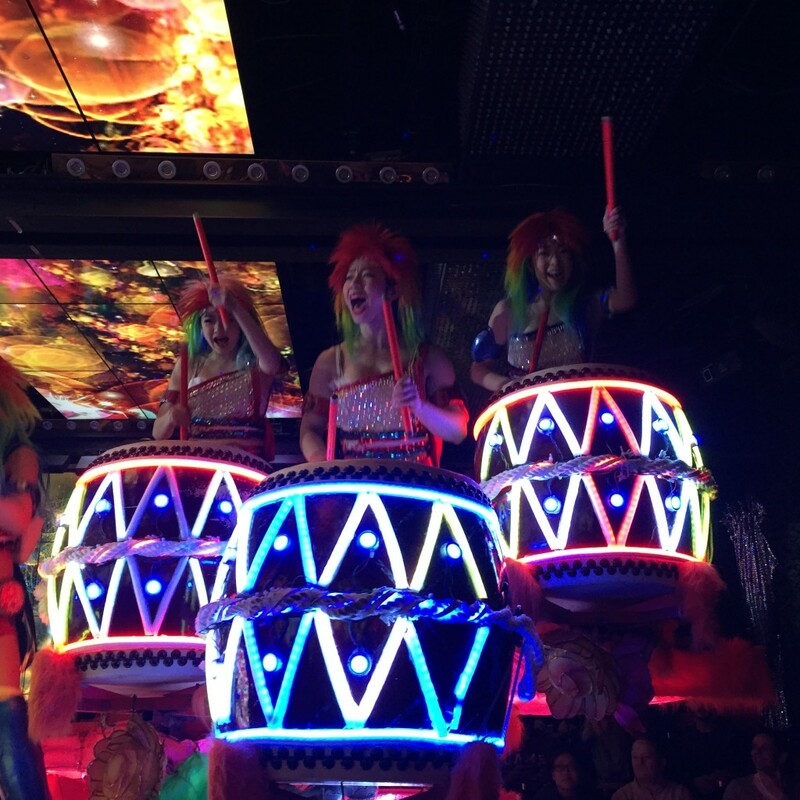 Rainbow ladies on the drums. 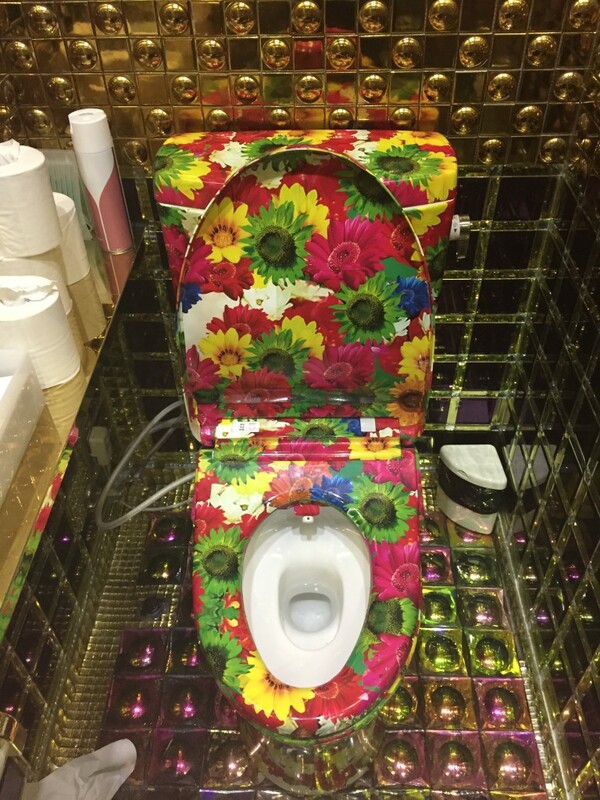 The most incredible bathroom at the Robot Restaurant. The bar at the robot restaurant. Post show we walked to dinner at an Italian restaurant (it was the only restaurant without a line in the area) called Italian Market, but really should have been called, “We’re Learning to Make What We Think is Italian Food”. Needless to say, the food was nothing special. After dinner we walked to Don Quijote—a random four-story souvenir shop, and left almost immediately after to go back and pack. 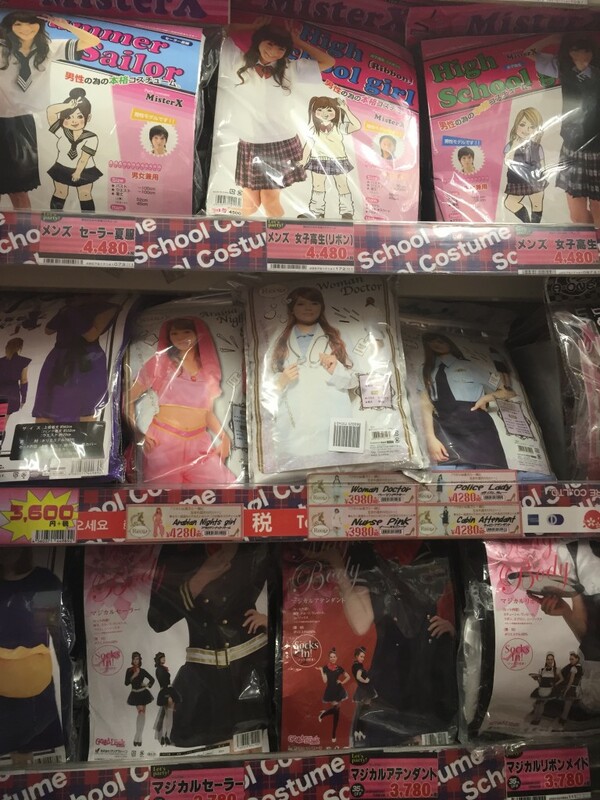 Weirdly, there is an entire isle devoted to transgender costumes at Don Quijote Market. 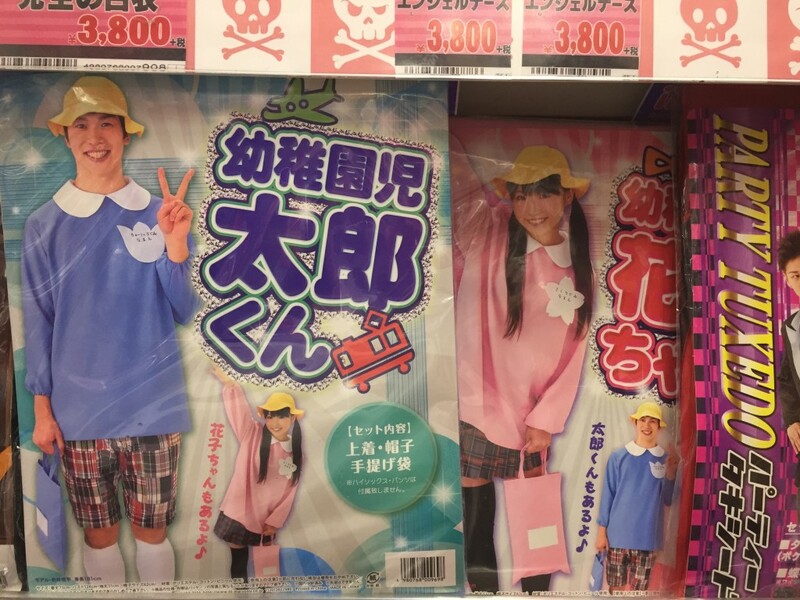 I thought about getting these for Halloween this year…. not quite sure what they are supposed to be. Today was the last day of our trip. 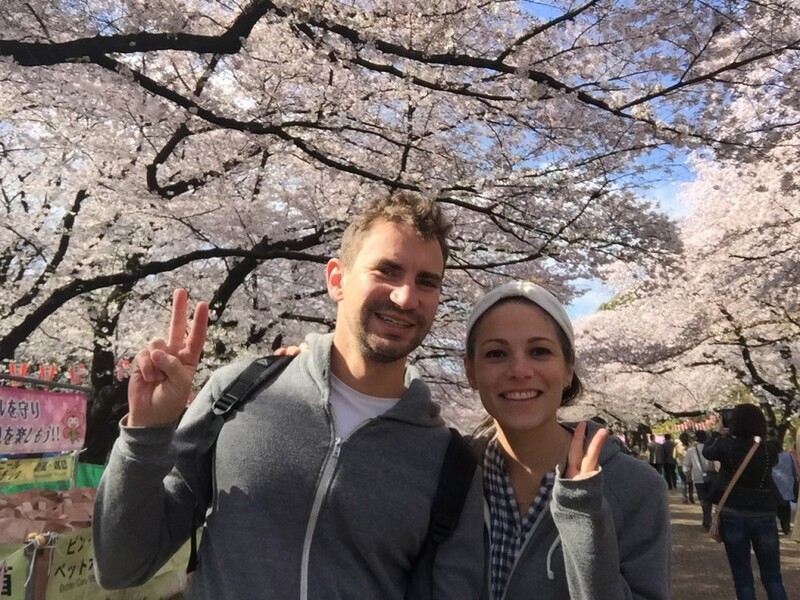 We woke up early to go back to Ueno Park to check out the cherry blossom trees during the day, which was more magnificent than the other night. It was crazy to see how many people were out so early at the park considering how dead the city feels at this time of day. 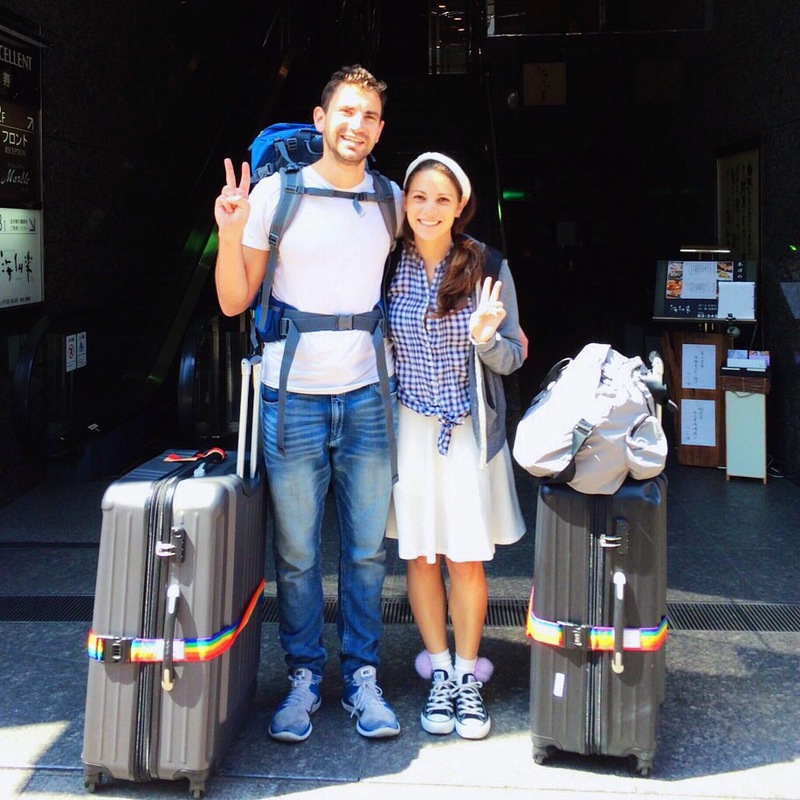 After a bunch of photos we left and took the train to Harajuku station. We walked to The Roastry by Nozy Coffee for one last session with Riku (he’s the greatest) and went back to the hotel to get our bags. 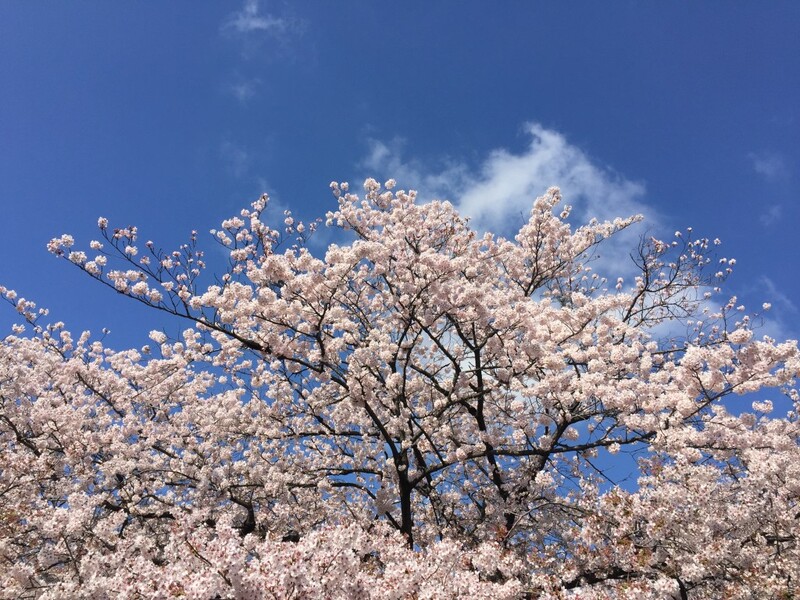 We took a 30-minute JR train to Noppori Station and another 30-minute Skytrain to Narita International Airport. 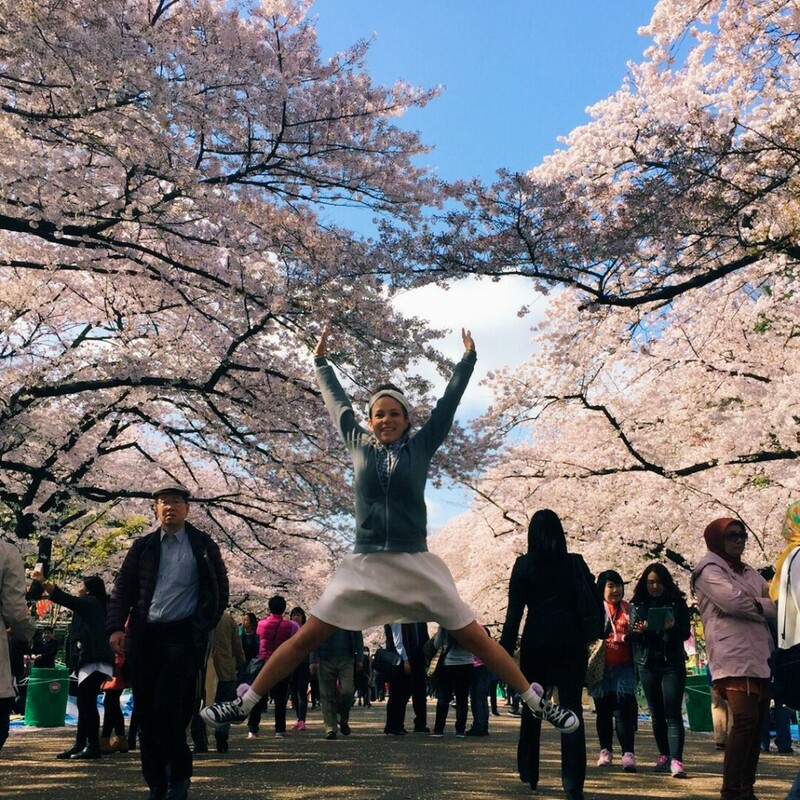 Last poses with the Sakura Blossoms. 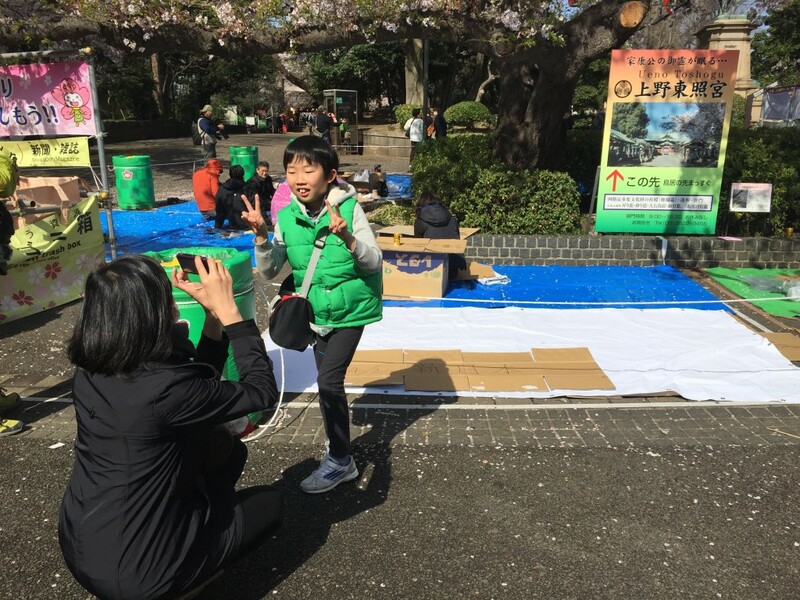 Found this little wierdo being forced to pose by his mother in front of something near the cherry blossoms, but not the main attractions themselves. One last stop at The Roastry by Nozy Coffee with Riku. At the airport we happened to bump into a friend I met abroad in Argentina named Ben. 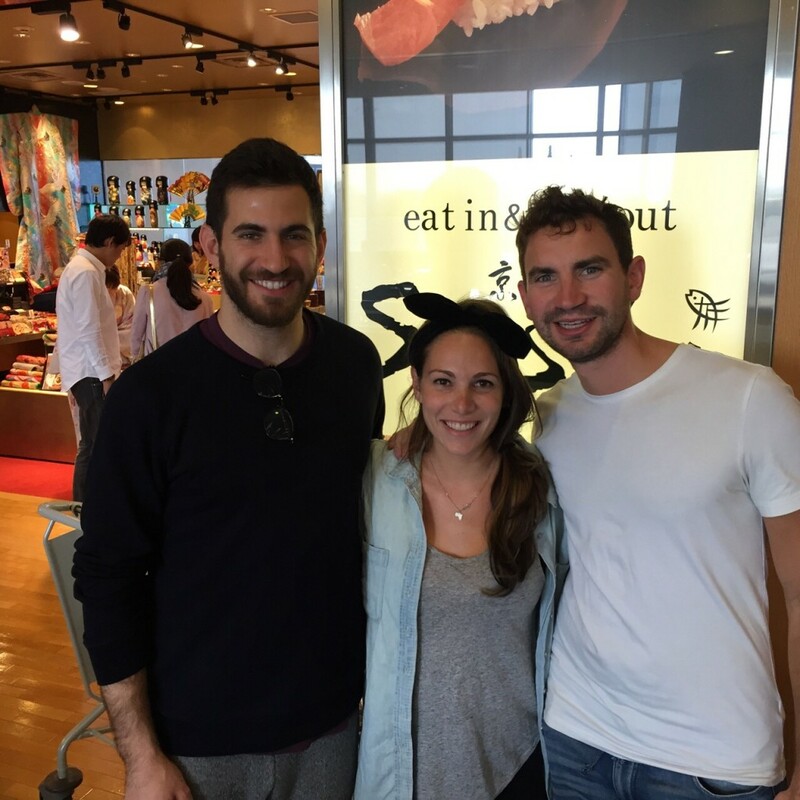 Ben joined Daniel and I for sushi at Gate 33 (recommended by Tessa) for our last meal at Narita Airport—sometimes the world feels so small. 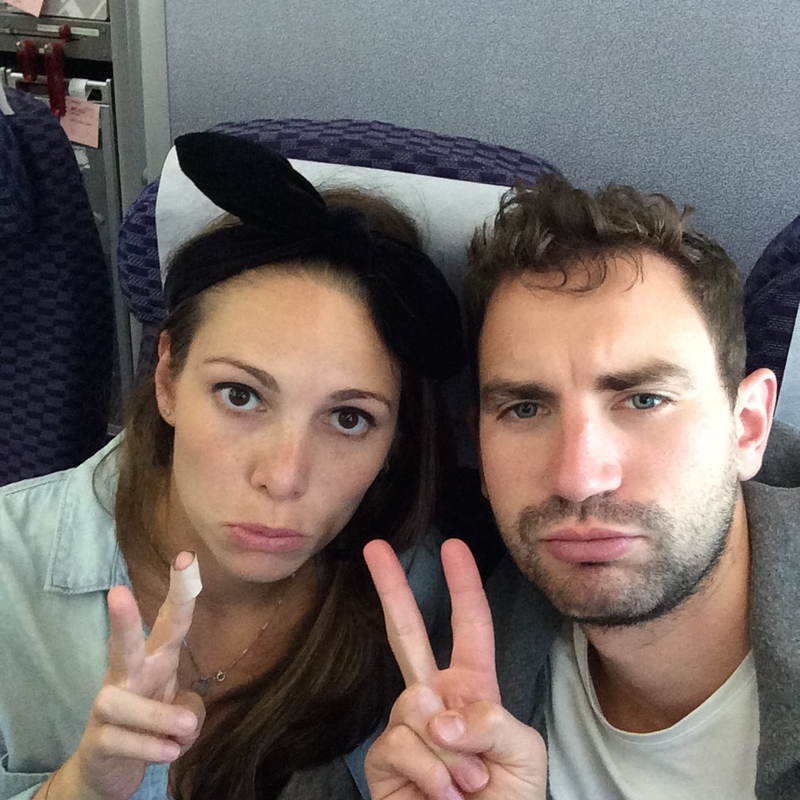 Now were sitting on the plane on the way back to Los Angeles. 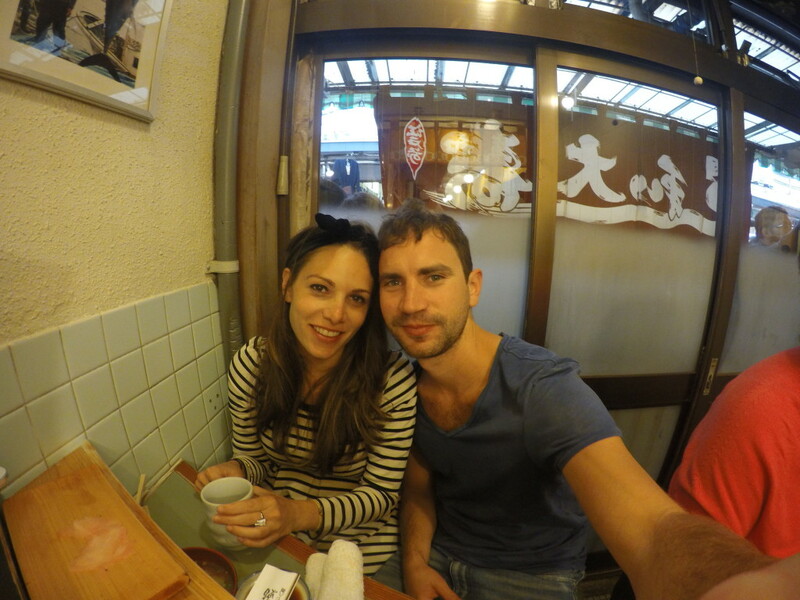 Outside of Gate 33 sushi restaurant at Narita International Airport with Ben. I can’t believe it’s been two months since we left. It’s been a wonderful adventure filled with amazing experiences and memories that we won’t soon forget. Stay tuned as we’ll continue to post some other amazing things about the trip that we didn’t have time to do on the go. Thanks so much for following our journey—we hope you enjoyed it! Hey! Hi! I’m Lauren, but only my mom uses that. Most people call me Jacks or Jaxy—and I’m short, so at some point in time I acquired the title Pocket Jax. I was born and raised in Los Angeles, went to school at The University of Michigan, and lived in San Francisco the past four years.